I've looked all over this forum and all throughout the wiki, and I've found no reasonable explanation to what's going on. It's driving me crazy! There's no reason this should be working the way it is according to everything I've read, but it very, very much is, and I can't find anyone else who has the same problem. Conversations with references weren't working in my own custom-made story, so I opened up the Conversation.taf sample story and looked in there. The subject is '[my name is/i am/i'm] %text%' and you're supposed to put any of those three in and then whatever the text of your name is going to be... only, this is what happens when I do just that. so, already it doesn't work anything like how the demo works in the wiki, where it explicitly shows the author just typing that in directly and having it just work, but I was already confused about that. So I tried every permutation of that, maybe I need to be in conversation with her already, or maybe I need to 'say' it instead of commanding it..? Ignored. And I saw a thread that maybe talked about this in some way but, please forgive me, I really couldn't understand what was going on, what the workaround apparently was, and from what I saw it had to do with entering the conversation. However, clearly I am already in conversation with her, as I can use any other conversation commands/topics that she allows and they work perfectly. So, what's the matter? I really would prefer this to making tasks (which seem to take references just fine) that require conversation with specific characters for every single character that needs a reference-based subject like this. "Say", "Ask" and "Tell" will automatically put in a conversation. 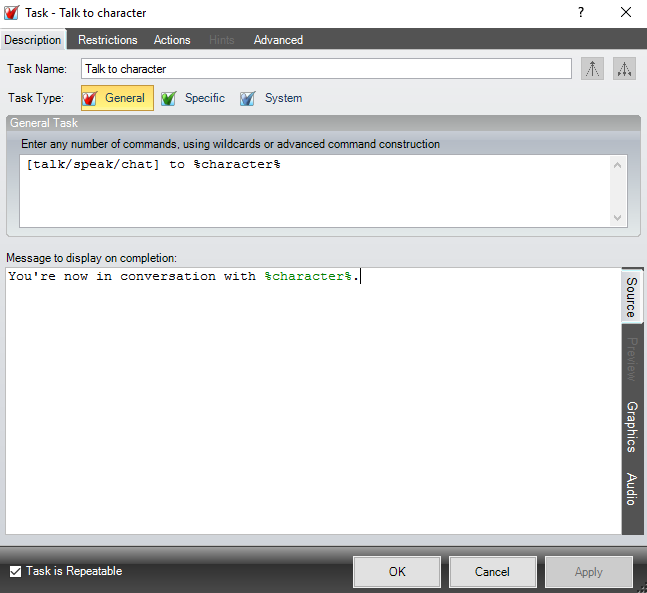 You can however force the player to be in conversation using an action command in a task. Check under the "conversation" tab when you create an action in a task. Once you are in conversation with a character, the command "say" can be omitted. That's patently false, at least as far as my testing has gone. As you can clearly see, only when I add 'say' do I get any result, and I'm using the active greeting to enter the conversation, as is clear by how 'say nothing much' gives the expected mid-conversation reply without adding the passive greeting. So while in conversation, and using the command the only way in which it actually works, the result is that I get ignored, but only with commands using the reference '%text%'. I have yet to test other references. Unless 'to be in conversation' means more than one thing in this engine, where if you use the active greeting you are still, somehow, not 'in conversation' despite being able to ask/tell subjects and get mid-conversation replies as though you were 'in conversation'. ...it bears exactly the same result. I'm put 'in conversation' even by your definition, and I still can't omit 'say', and at the same time the %text% reference is totally ignored. 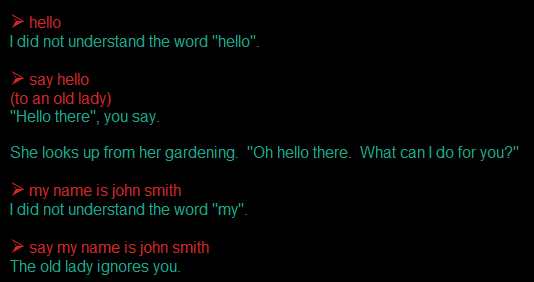 It should be "say my name is john smith"
This was a typo in the wiki that I have now fixed. Now the bad news. I tried this in both the latest version and a much older version. It looks like there is a bug in the latest version of the runner. saabie wrote: It should be "say my name is john smith"
Saabie, have you put up a bug report on this one? No, somebody with more experience than me with using conversations should look at this one in more detail. Well, that's a shame. Is there any good workaround that I can use right now, or will I just have to wait until this bug is fixed? Maybe some work I can do to correct it myself? Make sure that the priority is high (i.e. low priority number) so that the task runs instead of "say something to character". You could try %text1% instead of %text%. I think it broke when I added multiple text references. Is there a bug report for this? I raised an item, and this is fixed in the next version.